Just finished watching the most anticipated UFC card of the year. It featured the re-match between perhaps the greatest martial artist the competitive world has ever seen –Anderson Silva– and the young upstart who stole his throne back in July, the new Middleweight champion, Chris Weidman. No one knew what to expect. In general there were two camps. The first argued that Silva’s time was done. He was nearing 40, Weidman was in his prime, and Weidman had that certain quality that would always allow him to be Silva’s kryptonite. The other camp felt that the first fight was a fluke, that Silva had not taken it seriously, and that a renewed, focus Silva would easily dismantle this young nobody. What no one –and I mean no one– expected was what came to pass. When the fight was about to start, and Silva had begun his slow walk to the octagon (stopping oddly a couple of times to crouch and seemingly pray), I said to my sister, “Something weird is going to happen.” I didn’t know what I meant then. I think I meant that a weird Silva might show up, one that would refuse to engage. 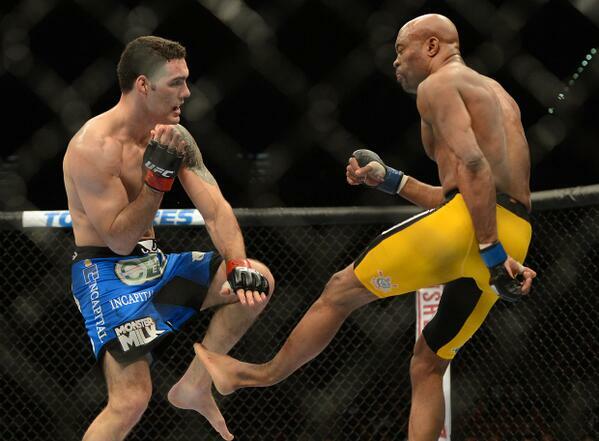 Or maybe even Silva would pull some bizarre retirement thing and just offer up his chin to Weidman. Want to see it in motion? Click here. And here’s video of Silva being taken out on a stretcher. I’m recalling grimly my own kickboxing training decades ago. In Muay Thai, we used to smash our shins with either ice blocks or the handles of our skipping ropes in order to numb the nerves so that kicking with our shins doesn’t hurt as much. One of the important skills we were supposed to learn (that frankly I never really learned well) was how to “check” leg kicks; that is, how to turn your shin in such a way that an incoming leg kick hurts you less and maybe hurts the other guy sufficiently that he is discouraged from throwing further leg kicks. UPDATE: Of course, the master Bas Rutten called it over a year ago.